PHILIPPINE SEA - The Bonhomme Richard Expeditionary Strike Group (BHR ESG), along with the embarked 31st Marine Expeditionary Unit (MEU), completed certification exercise (CERTEX), March 29. CERTEX is conducted to evaluate the integration of all elements of the Bonhomme Richard Expeditionary Strike Group (BHR ESG) and 31st Marine Expeditionary Unit (MEU), testing their combined ability to plan for and execute mission essential tasks. “Every Sailor and Marine, no matter what job they hold, plays an important role within our blue-green team,” said Capt. George Doyon, commander, Amphibious Squadron 11. “It is through these trainings that we see how each of our small parts play into the bigger picture and maintain our mission capabilities as a formidable amphibious force.” Ships of the ESG and 31st MEU conducted CERTEX from March 21-28 in the vicinity of Okinawa, Japan where the 31st MEU is forward deployed to. During the CERTEX period, Sailors and Marines executed the wide range of MEU missions from a sea-base such as non-combatant evacuation operations, humanitarian aid and disaster relief exercises, mechanized raids, visit, board, search and seizure operations, and numerous flight operations in support of these drills. Through these scenarios both branches worked in unison to accomplish critical amphibious operations ranging from launching and recovering surface and aircraft like landing craft air cushions, landing craft utilities, and MV-22B Ospreys to providing a processing platform for casualties during a simulated evacuation drill. 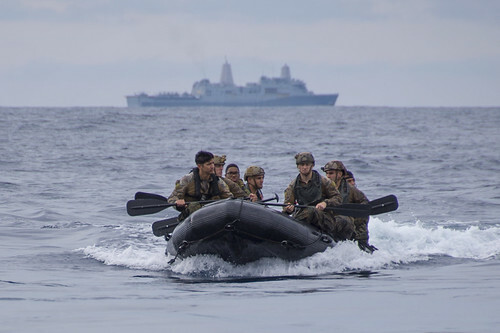 Bonhomme Richard Expeditionary Strike Group, with embarked 31st Marine Expeditionary Unit, is on a routine patrol operating in the Indo-Asia-Pacific region to enhance warfighting readiness and posture forward as a ready-response force for any type of contingency.